First things first this evening. I need to apologize for being so late in posting the winner of my reaching 51 followers. Between general living and some laptop computer problems, my resident computer geek and my random generator are one and the same. We were finally able to pick the winner last night and she is Annette from Netty's Craftings. 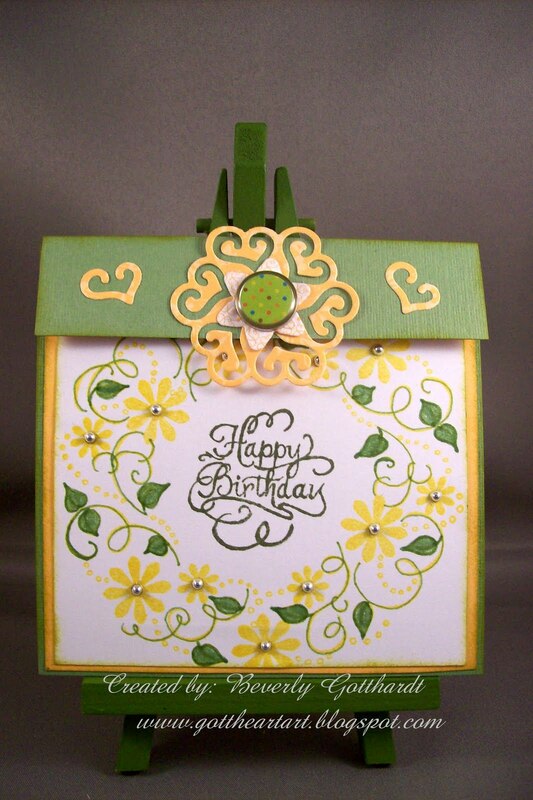 I call Annette an artist first and then a card maker, she has created some phenomenal projects lately. Be sure to hop over and check her out for some wonderful inspiration. Annette be sure to email me granybg@yahoo.com with your snail mail address so I can get your package off to you. Don't despair girls there will be some more blog candy in the near future and I won't make the puzzle as hard next time. I'm approaching 500 posts and then when I hit 75 followers there will be blog candy for that. Now on to my card. Mine is a little different than the instructions on Splitcoast Stampers, but I had this green card stock already folded. Waste not, want not. and what a coincidence Annette just happens to be on their design team. All my followers are such talented people, I'm continually trying to strive to keep up to their standards. Supplies: Green card blank unknown, Papers: Stampin Up-Whisper White, Patterns Pack II and III, So Saffron, Stamps-Heartfelt Creations GRS-210, Ink: Stampin Up-Daffodil Delight, Kiwi Kiss, Always Artichoke, Stampin Up marker-Wild Wasabi, Spellbinders Shapeabilities-Contemporary Hearts, Michael Richards-metel dots, brad unknown, magnetic snaps-Basic Grey, glue pen. 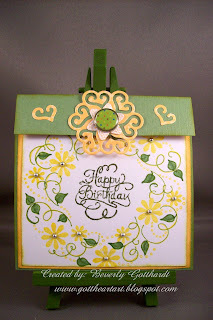 Gorgeous flap card!!!! 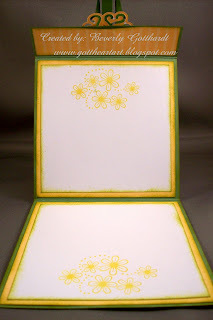 Love the stamping and the top die cut!! Thanks for joining us at Let's Ink It Up :)))) Oh and woohooooo Annette!!!!!!!!!!!! Stunning creation, inside and out. Thanks for joining Let's Ink It Up for our first challenge. Good luck and hope to see you again soon. Lovely creation all round. Thanks for playing at Let's Ink It Up. I love this card, it is super. Thanks for playing along at Let's Ink It Up. Congrats to Annette on the candy win. Now for my really personal comment Beverly....LOL, 'WOW oh WOW' am over the moon you picked me, that is so very kind of you, what a lovely lady you are.... will be emailing soon you can bet on that.... Thank you again my friend and great supporter. OMG, Your Flap Card is adorable. I love your colours. This is such a pretty card! Love those colors together!! Thanks for playing along with us at Project Tuesday!!! This is a fabulous card! I love the colors, and the design! Thanks for playing with us on our first challenge at Let's Ink It Up! This is very lovely! I especially like the unique design of it. that round heart puncher is adorable dear and gorgeous color combo ...What a lovely card Beverly..nice the inside too..